Video games are pretty damn addicting. From Pac-Man to Super Mario Brothers to Street Fighter 2 to Halo to Minecraft. As addictive as these games may be, nothing is going to stop generation after generation from playing them. Just remember to balance the gaming out by playing outside and doing non-virtual activities with your family and friends! Luis C. Suarez’s animated film RPG Metanoia perfectly captures the essence of both positive and negative sides of the virtual world – the endless, awesome fun that friends can have playing online with each other as well as the dangerous addictive nature of becoming virtual zombies. I watch a Filipino film about once every 4 years to get a sense of any sort of progress in the usually disappointing Philippine film industry. After vacationing in Cebu recently, I browsed a local video store and saw the RPG Metanoia DVD popping out among the many other amateurish-looking soap opera Pinoy movies released on DVD. 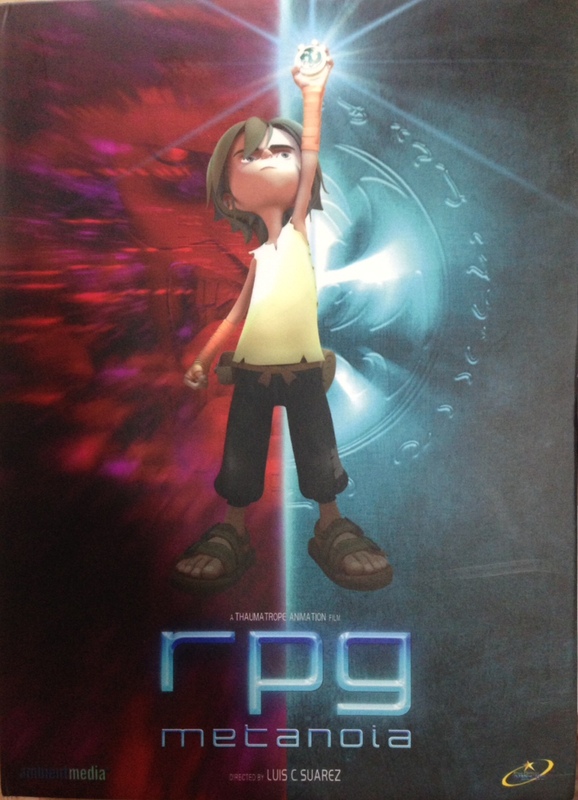 Looking at the front and back cover of the DVD case, the photographs of the animation style looked pretty good. As a huge fan of animated films from all over the world – from Ghibli films of Japan to Michel Ocelot of France – I took the chance and blind-bought the RPG Metanoia DVD without even watching a trailer or reading a review. Best video-buying decision I’ve made in ages! As the first CG-animated film from the Philippines (as well being the first one that played in 3D in local theaters), Luis C. Saurez’s RPG Metanoia is a beautifully animated film for all to be proud of. Period. Reading other reviews online about how the animation style is “not Pixar, not Disney, not Hollywood” is pretty pathetic. Metanoia is a refreshing example that not all animated films have to copy the same exact mold. I may be biased to love hand-drawn animation more since CG-animation has been a bit too focused on bug-eyed, hyperactive, loud characters, but I still like CG-animation or any animated film that breaks away from any typical mold – The Iron Giant, The Tale of Princess Kaguya, Mind Game, Kirikou and the Sorceress, The Secret of Kells, etc. The animation style in RPG Metanoia is almost like a combination of stop-action motion and CGI but much smoother. The designs, lighting, and texture of the characters and backgrounds have a soul that many big-budget CG-animated films may be missing. Costing around 2 million US dollars, Saurez and his filmmaking team have created a very impressive work of art. Not only is the animation exciting to watch with its many impressive real-world street scenes of Philippines and fantastic virtual worlds that the characters enter when they play their online video game, the action choreography is as exciting as any Woo Ping Yeun or Tsui Hark film. The musical score is quite intense and epic as well – the filmmakers managed to evoke the best elements of John Williams’s Indiana Jones and Star Wars without copying him. Beautiful animation, intense score, and exciting action scenes would be worthless had there been an awful screenplay with laughable dialogue. Thankfully, RPG Metanoia has a naturally flowing screenplay with lovable characters and entertaining dialogue that makes this the best written film from the Philippines I’ve ever seen yet. It’s a shame that many may have skipped seeing this film because it’s the type of film that’s marketed to children and teens. RPG Metanoia is an entertaining, touching film for all ages in the same way that millions of adults enjoy Disney, Pixar and Ghibli films. While the Filipino DVD from Star Home Video does not advertise the technical specs on the back cover, I’m happy to report that this NTSC All-Region DVD is 1.85:1 Anamorphic widescreen with a Dolby Digital 5.1 Tagalog soundtrack. I don’t know about other new Pinoy DVDs, but this is the best quality DVD from the Philippines I’ve owned yet. The video quality is very good and the DD 5.1 audio option is very active. The English subtitles are perfect, and also includes Tagalog subtitles. Extras are about 15 minutes of making the film, a couple non-finalized deleted scenes, images, music video, trailers, as well as a non-subtitled Tagalog audio commentary for the film. Besides lovers of Mamoru Oshii’s Avalon, Matrix, Tron, Wreck-It Ralph, and video games, anyone who loves a good animated film should definitely check out RPG Metanoia.